We were extremely fortunate to have professional rugby player Charlie Sharples visit JMHS last week. 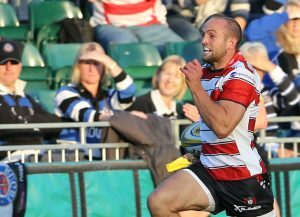 Charlie currently plays for Gloucester and has also represented nationally wearing the England shirt on four occasions. He spoke to Y10, Y11 rugby players and A-Level PE students about the life of a professional rugby player, including: training, the day-to-day programme, nutrition, rest and recovery and the importance of having a career to fall back on when the rugby ends. Additionally, he spoke about careers available in rugby, from coaching to nutritionists and even the people who fly drones over the training group to be able to monitor how hard the players have worked! Students found the talk very useful and inspiring and we are grateful to Charlie for taking the time out of his busy schedule to come in. After the presentation concluded, Charlie took the time to sign autographs and shirts for the students. We we wish Charlie and his team a successful season.